Born out of the popular blog Kale & Caramel, this sumptuously photographed and beautifully written cookbook presents eighty recipes for delicious vegan and vegetarian dishes featuring herbs and flowers, as well as luxurious do-it-yourself beauty products. Plant-whisperer, writer, and photographer Lily Diamond believes that herbs and flowers have the power to nourish inside and out. “Lily’s deep connection to nature is beautifully woven throughout this personal collection of recipes,” says award-winning vegetarian chef Amy Chaplin. Each chapter celebrates an aromatic herb or flower, including basil, cilantro, fennel, mint, oregano, rosemary, sage, thyme, lavender, jasmine, rose, and orange blossom. Mollie Katzen, author of the beloved Moosewood Cookbook, calls the book “a gift, articulated through a poetic voice, original and bold.” The recipes tell a coming-of-age story through Lily’s kinship with plants, from a sun-drenched Maui childhood to healing from heartbreak and her mother’s death. With bright flavors, gorgeous scents, evocative stories, and more than one hundred photographs, Kale & Caramel creates a lush garden of experience open to harvest year round. Lily Diamond is a writer, photographer, and proponent of wildness in the kitchen. In 2012, she created the award-winning, much-beloved blog Kale & Caramel. Lily grew up on Maui and graduated from Yale University. She lives in California. "I am so happy Lily Diamond has expanded her exquisite blog into an actual book. Her ability to frame solid instruction (both herbal and culinary) with a deeper take on what it means to live through our senses is a gift, all articulated through a poetic voice, original and bold." "Lily’s deep connection to nature is beautifully woven throughout this personal collection of recipes. 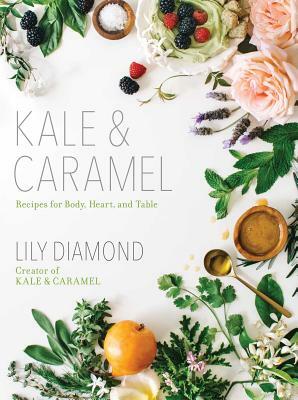 Whether it’s the healing power of herbs, delicious and unique flavor combinations or the stories of her mother’s natural medicine, Kale & Caramel truly is a book for body, heart and table." This is a remarkable book of food and longing, tending as much to our deep human need for storytelling as our hunger for vibrant, life-sustaining nourishment. "I want to inhale and grow and cook and slather on every single thing in this book! Lily has carefully crafted each recipe to harness the healing powers of flowers and herbs in a simple and accessible way. A gorgeous guide to plant-based self-care!" — Laura Miller, Author of Raw. Vegan. Not Gross.